With the MirageDrive with Glide Technology powering the way, the "Revo 11" is a lightweight galloper that slides easily through wind and waves. 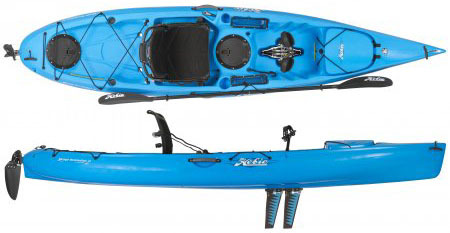 Ideal for small-to-midsized kayakers or bigger kayakers out for an unencumbered cruise, the Revolution 11 allows you to adroitly stalk fish and confidently explore reefs. With generous below deck stowage, smart rigging on top, and optional sailing kit, the Revolution 11 is ready to roam. New & Used Kayaks, Whitewater Kayaks, Double Kayaks & Canoes... Out our back door...into a kayak, and on the water. The ultimate in canoe and kayak paddles... Light, buoyant swing... Silky smooth forward strokes. Stays dry and breathes... Kokatat Dry Suits. Be safe, stay afloat... wear life jackets that fit. Kayak skirts keep paddle drips & water out.